Employees have heard you loud and clear, Ms. and Mr. Employer. They got the message that it’s time to become a savvy health care consumer. They’re out there researching medical ailments and specific diseases, trying to understand medical procedures, and figuring out how their health insurance works and how to reduce their health care costs. So finds Pew in their Health Online 2013 Report, an update on their investigation into the online health habits of adult Internet users. Employees start their search with Google and end it with their doctor, and somewhere in between they run things past friends and family. With or without aid from a search engine, 70 percent of all U.S. adults sought out their doctor or other health care provider for information, care or support, and 60 percent sought out the same from friends and family. 27 percent of Internet users have looked for information about how to lose or control weight. 25 percent have looked for information about health insurance, including private insurance. 14 percent have looked for information about caring for an aging relative or friend. 12 percent have looked for information about pregnancy and childbirth. These searches bear testimony to what’s working in employer health communications and could suggest what’s not. The insured are far more likely to research a specific disease or medical treatment than the uninsured. While the Pew study doesn’t dig into the “why” behind these statistics, it’s reasonable to assume employees see the link between their involvement in health care decisions and what they pay, and they’re doing the necessary homework. Regarding searches for other health-related information, could these numbers support what we’ve learned from employees through other studies: they aren’t getting enough of what they need from their employers so they’re out there looking for the answers themselves? There is one thing that stops users in their health-education tracks: paywalls. 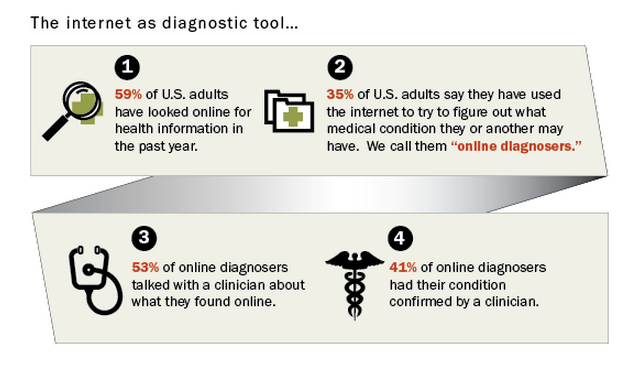 Adult Internet users are seeking useful online health information but they’re not willing to pay for it. When they hit a paywall, only 2 percent pay the price of admission. The majority (83 percent) go elsewhere. Employers with virtual paywalls — benefits websites on intranets, locked down by passwords — should take note. What they view as a necessary way to maintain employee privacy, employees may see as a virtual paywall. What aids searches, however, are smartphones. Equipped with a smartphone, adults take on all sorts of new activities: texting, posting pictures, social sharing. The same is true with seeking online health information. Some 52 percent of smartphone owners look up health information by phone, compared with only 6 percent of cell phone owners. Employers might consider whether they should give more employees smartphones. In today’s world, a smartphone is not only a business tool, it’s a health and well-being tool, too. This was originally published on Fran Melmed’s free-range communication blog. Fran Melmed is an award-winning HR communications consultant specializing in workplace wellness and health care consumerism. Prior to founding context communication consulting llc context communication, Fran worked at Hewitt Associates in their Talent and Organizational Change and Communication practices in the U.S. and U.K. Contact her at fran@contextcommunication.com, and follow her on Twitter at http://twitter.com/femelmed.